Love the firmness great for side sleepers!!! 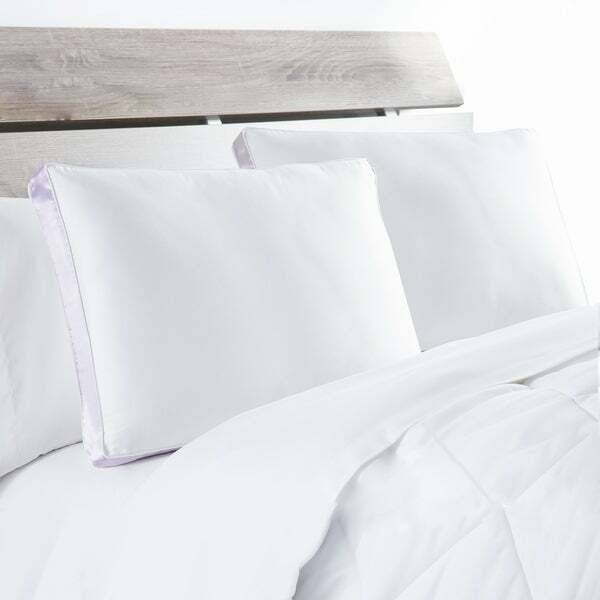 This handy pack of two classic pillows from DOWNLITE features an extra-firm density and hypoallergenic fill that is perfect for side sleepers. Made with 300 thread count cotton sateen fabric and satin trim gussets, these pillows are machine washable for easy care. Dimensions 34.0 In. X 18.0 In. X 5.0 In. Just firm enough for a side sleeper like me. I'm really picky when it comes to my pillow. My husband can sleep on most anything and get a good night's rest. Our pillows were to the "staying in the folded position" toss time. I did some research and liked what I read about these Extra Firm 300 Thread Count pillows. Excited to find a set of them on Overstock, I ordered them. I wanted us to sleep on them a few weeks before leaving a review. I'm very impressed and pleased! My husband likes his, too. These are not extra firm in the sense of being hard and "bouncy". I can turn and move easily and comfortably; my neck isn't stiff and sore. As a side sleeper, I don't like my face buried in a pillow to where I can't breathe. These pillows are a tad shorter than most standard pillows. That doesn't bother me, but you might want to know. They are thicker than my other pillows. The thread count feels amazing. I can definitely tell the difference that thread count makes. I have no reservations in recommending these pillows. Extra Firm 300 Thread Count Side Sleeper Pillows were as expected from a quality company. They are firm but very comfortable. I had a Extra Firm pillow for several years and got many comfortable nights' sleep out of it. After years of use, it had become lumpy and was time to replace. I bought this set hoping they would be the same or similar, but they are not. Either these are a cheap knock-off or **** went very cheap when updating this product. First of all, they are a few inches narrower than other Standard/Queen size pillows they have. This means there is less room to move my head around the pillow. Second, the pillow is soft. I would not consider these "extra firm." Maybe a medium firmness at best. I do not recommend and will keep searching for a truly extra firm pillow. These are great pillows for a side sleeper! Pillows are soft to the touch, plump & firm, which is exactly what I wanted. They are great for side sleepers. These pillows are great. Perfect for side sleepers. Firmness is perfect for what I like. So far they have held up and have not flatten at all. I would recommend them or buy them again. In the past I had always bought Ralph Lauren extra firm pillows but the last time I bought them they didn't seem to be as good or last as long as before so I decided to give these Extra Firm a try and I love them. They will now be my only pillow purchase. I sleep on my side and my back and this pillow is great no matter how I slleep. Just got the pillows, but so far so good. Perfect thickness and firmness for a side sleeper. Definitely recommend. Great pillows! Restful sleep! Perfect for side sleepers. I would have given these a 5-star, but they sleep hot. My favorite pillow and I have tried them all. The inner stuffing is like fluffy silk, no hard places. Very comfortable, a must have for a side sleeper. I'm a side sleeper and my old pillow needed replacement. Bought these because they come in a package of 2 and it was a great purchase. Firm, big (king size), awesome! These pillows are EXACTLY what I expected when they arrived on my doorstep. They feel great, are high quality, and were way cheaper than buying in a store. This was a great purchase!!! these are some of the best pillows I have ever purchased. they keep their shape and don't go flat and smooch after a few months but stay as they were when first purchased. I bought 4 for the guest room bed and 2 for my bed and plan to buy another set for my bed as I love to prop up and read at night and these are just excellent for that. Great pillow so far,happy with it !! Love the pillows! Very comfortable. I have had neck surgery a couple of times and i am a side sleep. These provide the support that i need. Quality is exceptionally well designed. It is exactlly what i was looking for. Could not beat the excellent price any where else. Very comfortable and reasonably priced. Really good quality, I'm very impressed. I would buy again. Very comfortable and quality made pillows. I purchased them for my master bedroom California King bed set and I would say the firmness matches my mattress, but if you have a softer mattress then I would probably go with one step down in firmness. They also work well if you sleep on your side. Nice quality for price. These are on spare bedroom so they don’t get much use. I have looked high and low for pillows because I'm a side sleeper and most pillows I would get, I would end up with horrible neck pain. And finally I stumbled over these pillows. OMG&gt;... what a life saver. I now get great night sleep, pillow stays pretty firm. If pillow because a lil settled at night, I just flip and I'm good to go. Love these pillows, actually thinking of getting another set. I’ve had a hard time finding good quality and long lasting pillows. These were highly recommended to me and so far have not disappointed. They’re so comfortable and have kept their shape very well! Wish I had found these sooner! "is this really a "standard" or a "standard/queen"?" This is a standard pillow. "Is this the king or standard size?" Both sizes are available on the product page. "I am a side sleeper. I need a really firm pillow that does not go flat in a couple of months. Does this pillow meet this requirement? Thank you." This pillow is not extra firm at all. It is actually quite soft. I am a side sleeper and use extra firm pillows. This is not the pillow you want. I continue to search for a truly extra firm pillow. Hope this helped! I agree with Kathy. This is not an extra firm pillow. I suggest you keep looking. I want an extra firm pillow (that is also a side-sleeper pillow) that can be laundered in the washing machine, and since I trust the Sealy name, I am expect I'll be pleased with this purchase. Because I'm Club O Gold customer, the free (and quick!) shipping that Overstock offers is great for a bulky purchase like this. It's a win-win scenario. features an extra-firm density and hypoallergenic fill that is perfect for side sleepers. Made with 300 thread count cotton sateen fabric and satin trim gussets, these pillows are machine washable for easy care.